Jim, Curt and K.C. Gulbro own and manage FoxFire Restaurant, in Geneva. 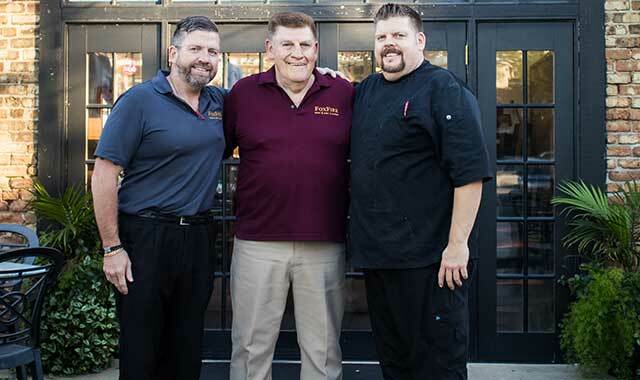 Now in its 14th year, FoxFire Restaurant, at 17 W. State St., Geneva, has established itself as a dependable and well-liked steakhouse thanks in part to its aged prime beef, pork chops and seafood. Don’t let its appearance intimidate you. From the outset in 2003, FoxFire has provided a casual setting where diners can enjoy contemporary American fare. Modern diners are becoming more sophisticated than ever, says Gulbro, and so the menu now includes items like free-range chicken and antibiotic-free beef and pork. This tribute to the elder Gulbro features a 6-ounce fillet crusted with a mix of Cajun spices; it’s seared and grilled, then served with a wasabi yogurt, sliced avocado and teriyaki sauce. Curt spends less time in the restaurant these days, though you’ll occasionally spy him serving as a maître d’. His sons, K.C. and Jim, serve in the kitchen and front-of-house management, respectively. A refresh of the menu used to occur once a year, but now it’s done three times; K.C. Gulbro says he’s considering adding a fourth review, to keep things fresh with each new season. One staple that doesn’t change is the prime steak: cuts of fillet mignon, rib-eye and New York sirloin. Mahi-Mahi is the restaurant’s top-selling fish; it’s served with a champagne sauce and scallop risotto. Walleye Piccata also is much in demand. FoxFire offers full bar service with frequent changes to the drinks menu. Twenty-three craft and mainstream beers are on tap, including local favorites Penrose Brewing Company, Two Brothers and Revolution. Fifty wines (mainly from California and Oregon, with a few from France and South America) are available by the glass; a like number is available by the bottle. A recently added signature cocktail, the New York Sour, is made with red wine, Crown Royal and a touch of agave that gives a pleasant flavor. Family-owned and -operated FoxFire can seat 180 indoors, with an additional 19 tables set on a seasonal patio outdoors. Free live entertainment – including blues, jazz, rock and sometimes country – is on the agenda Fridays from 7 to 10 p.m.
A private party room seats 24 and has hosted birthdays, wedding rehearsal dinners and other special events. Business presenters enjoy such amenities as Wi-Fi connectivity and TV hookups. The restaurant occupies an historical building dating to the 1920s. The original exposed brick – previously hidden by plaster – is once more exposed. The venue employs about 50 people in various positions from kitchen and bar to front-of-house. Reservations are accepted over the phone or via Open Table. FoxFire’s kitchen is open Monday through Thursday 11 a.m. to 9 p.m. and Friday through Saturday 11 a.m. to 10 p.m. This entry was posted on Friday, November 3rd, 2017 at 12:00 pm	and is filed under Dining Guide, Top Posts. You can follow any responses to this entry through the RSS 2.0 feed. Both comments and pings are currently closed.